Technical Car Experts Answers everything you need: Error code p0172 and p0174 on ford vehicle? Basically this means that an oxygen sensor in bank 1 detected a rich condition (too little oxygen in the exhaust). The Bank 1 is the side of the engine that has cylinder #1. You will more than likely not notice any drivability problems, although there may be symptoms such as a misfire. The MAF (Mass Air Flow) Sensor is dirty or faulty. Note: The use of "oiled" air filters can cause the MAF to become dirty if the filter is over-oiled. There is also an issue with some vehicles where the MAF sensors leak the silicone potting material used to protect the circuitry. There could be a vacuum leak. Check the fuel injectors, they may be dirty. Use fuel injector cleaner or get them professionally cleaned/replaced. Basically this means that an oxygen sensor in bank 2 detected a lean condition (too much oxygen in the exhaust). On V6/V8/V10 engines, Bank 2 is generally the side of the engine that doesn't have cylinder #1. You will more than likely not notice any drivability problems, although there may be symptoms such as a lack of power, detonation (spark knock), and/or a hesitation/surge on acceleration. 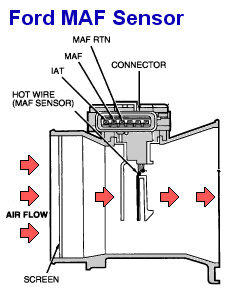 The MAF (Mass Air Flow) Sensor is dirty or faulty. Note: The use of "oiled" air filter can cause the MAF to become dirty if the filter is over-oiled. There is also an issue with some vehicles where the MAF sensors leak the silicone potting material used to protect the circuitry. There could be a vacuum leak downstream of the MAF sensor. Check for a dirty fuel filter and proper fuel pressure. A Ford P0171 is a LEAN code for cylinder bank 1, and P0174 is a LEAN code for cylinder bank 2. These codes commonly occur on many ford vehicles, and are set when the power-train control module (PCM) sees the air/fuel mixture is running too lean (too much air, not enough fuel). When the check engine Light comes on, either one of these codes, or both, may be found when a code reader or scan tool is plugged into the vehicle diagnostic connector. IF the vehicle is driven long enough, typically both codes will be set. A P0171 lean code for bank 1 is the cylinder bank on the RIGHT (passenger) side of the engine on Ford vehicles with a V6 or V8 engine and rear-wheel drive. A P0174 lean code for bank 2 is the cylinder bank on the LEFT (driver) side of the engine on Ford vehicles with a transverse-mounted V6 engine and front-wheel drive. This code is not set on four cylinder engine (no bank 2). A lean fuel condition may exist if the engine is sucking in too much air and/or the fuel systems is not delivering enough fuel. If bad enough, a lean fuel condition may cause lean misfire, a rough idle, hesitation or stumble when accelerating, and/or poor engine performance. Unmetered air can enter the engine through a vacuum leak, a dirty airflow sensor that is not reading airflow accurately, an EGR valve is not closing and is leaking exhaust into the intake manifold, an EGR valve that is allowing too much flow (because the EGR differential pressure sensor that monitors EGR flow is faulty and is under-reporting EGR flow). If the problem is not enough fuel, the underling cause may be a weak fuel pump , restricted fuel filter, leaky fuel pressure regulator or dirty fuel injectors. just ahead of the throttle body . The MAF sensor should be protected from outside dust and debris by the air filter, but sometimes the air filter doesn't fit real tight inside the housing and allows unfiltered air into the engine. Dirt can stick to the MAF sensor wire and form a coating that slows the response of the sensor to changes in airflow. The MAF sensor can also be contaminated by fuel vapors that back up through the intake manifold and throttle body when the engine is shut off. The vapors can leave a waxy coating on the sensor wire. This causes the MAF sensor to under report airflow, which in turn misleads the powertrain control module (PCM) so it doesn't add enough fuel to maintain a properly balanced air/fuel ratio. As a result, the engine runs lean and sets a P0171 and/or P0174 code (see Ford TSB 98-23-10 for details). If the MAF is dirty, the fix is easy enough: just clean or replace the MAF sensor. In many instances, the MAF sensor can be successfully cleaned by spraying the sensor element with electronics cleaner. Do not use any other type of cleaner as this may damage the sensor. Disconnect the air inlet tube just ahead of the sensor, and then spray the electronics cleaner through the screen at the wire element in the center of the little MAF sensor. Let the cleaner soak in for several minutes, then give it another shot of cleaner. Let it sit another five minutes, then reconnect the air inlet tubing and start the engine. If the lean codes keep coming back, the MAF sensor may have to be replaced if the engine does not have a vacuum leak or fuel delivery problem. Another common cause of Ford P0171 and P0174 ean codes is an engine vacuum leak. Ford TSB 04-17-4 details procedures for checking fuel trim and looking for vacuum leaks. On 3.8L Fords with a split-plenum intake manifold, the port gaskets and isolator bolt assemblies for the upper plenum can deteriorate over time and leak air, often as a result of oil being sucked into the intake manifold through the PCV system. Also the vacuum hose that connects the fuel pressure regulator to the intake manifold can swell and leak vacuum where the hose connects to the manifold. Ford TSB 03-16-1 says the fix involves several steps: remove the upper manifold plenum and replace the original gaskets and bolts with revised ones, replace the front valve cover with a revised valve cover that reduces the amount of oil vapor sucked into the PCV system, inspect and replace the fuel pressure regulator hose, and finally, reflash the PCM so it is less sensitive to lean fuel conditions. Ford p0171 AND p0174 lean codes can also be set by a bad EGR differential pressure sensor. These sensors have a very high failure rate once a vehicle has more than about 60,000 miles on the odometer or is more than five or six years old. The DPFE sensor is mounted on the engine, and is attached with two rubber hoses to the tube that routes exhaust gas to the EGR valve. The original equipment sensor has an rectangular aluminum housing about three inches long. Corrosion inside the sensor reduces its sensitivity to EGR flow, causing it to under-report EGR flow. The PCM responds by increasing EGR flow, which may keep the EGR valve open longer than usual creating a lean condition in the engine. Thus, a bad sensor may set a P0401 code (insufficient EGR flow), or it may not set an EGR code but a P0171 and/or P0174 lean code instead. The cause of the P0401 code in most cases turns out to be a bad DPFE sensor, not an EGR valve problem or an EGR valve that is plugged up with carbon (though this can also set a P0401 code). An aftermarket replacement DPFE sensor costs less than $50 and usually gets rid of not only the P0401 code, but also the P0171 and P0174 codes, too. Labels: Error code p0172 and p0174 on ford vehicle.